The Nikon 1 J5 is a mirrorless interchangeable lens camera (ILC) that bundles welcome features with quirky and frustrating ones. The J5 is fun to use, and it offers a good set of special effect features that will appeal to people who are moving from a point-and-shoot camera to their first interchangeable lens model. This good-looking camera is extremely thin, which should also appeal to people seeking their first intermediate-level camera. However, quite a few aspects of the Nikon 1 J5 are annoying. The lack of control buttons forces you to make most settings changes through the LCD screen, and Nikon didn't do a great job of making this camera's navigational aspects easy or fast to use. The camera is sluggish in response to commands, which is incredibly frustrating after a while. When you factor all of these things together, the result is an average intermediate-level camera. Some photographers may find that the J5's benefits greatly outweigh its drawbacks, and they'll appreciate this model. Others will become frustrated with this camera to the point that they won't enjoy using it. So, before you purchase this mirrorless ILC, make sure you understand its drawbacks and benefits to see how they match up with your needs. With a 1-inch CX-format image sensor and 20.8-megapixel resolution, you should expect to attain top-notch image quality from the Nikon 1 J5. While its image quality is good, when you use the images to make extremely large prints, the results are soft. Any image concerns are probably related to the average-quality kit lens that shipped with the J5. A better lens would no doubt yield better results. Low-light performance is solid with the Nikon 1 J5. You are limited to using the camera's pop-up flash unit for your low-light photos because there's no hot shoe for adding an external flash. As an alternative, you can increase the ISO setting. Nikon included a variety of movie-recording modes with the J5, including a 4K-resolution option. However, because you can only record 4K movies at 15 frames per second, this option isn't as useful as it could be. The burst mode speeds of the Nikon 1 J5 are impressive, working at up to 20 frames per second. You can shoot at speeds up to 60 frames per second, but you're limited to recording only 20 images at a time, so you'll only be able to record for one-third of a second in this mode. For those migrating from a beginner-level, fully automatic camera to the J5, the inclusion of a host of automatic and manual control settings will be helpful in your growth as a photographer. Make use of the automatic controls as you learn more about photography, migrating to the manual controls at your own pace. You'll want to turn off image review after photos are recorded, as the shot-to-shot delays are up to five seconds when you're using image review. These performance quirks are common in the point-and-shoot camera world, but photographers shouldn't have to suffer through such performance issues in the J5's price range. The LCD screen Nikon included with the J5 is of high quality. It includes touch-screen capability, which is great for the portion of the camera market at which it's aimed, and you can tilt the screen to almost 180 degrees, which is great for shooting selfies. A few design quirks with the mirrorless J5 stand out. Using the zoom ring on the kit lens is awkward, and the manual focus controls are not easy to use. The Nikon 1 J5 only can use microSD memory cards, which is a hassle, as they're easy to lose. 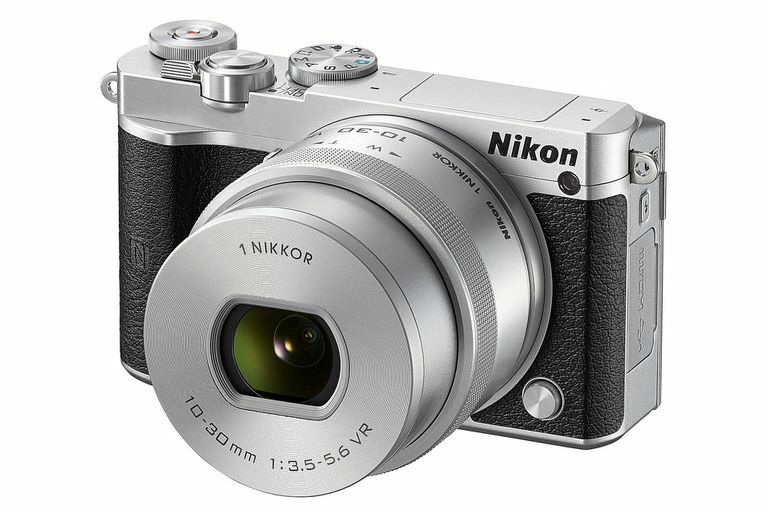 Users dislike the on-screen control option, called the Feature grid, that Nikon included with this camera. It takes far too many button presses and screen touches to make even the most basic changes to the settings. The Nikon 1 J5 is a nice looking little camera that does a decent job with image quality. As long as you don't expect to make large prints, and you can live with several operational quirks, the J5 is worth a look, especially if you liked the previous Nikon 1 J-series cameras, as the J5 is a good upgrade to those models.